Since reviewing farm science prevailed over seeing Betting Line win this year, I decided I’d put on my new Pink Pony birthday duds and trot up to Delaware to see an exhibition about harness racing. 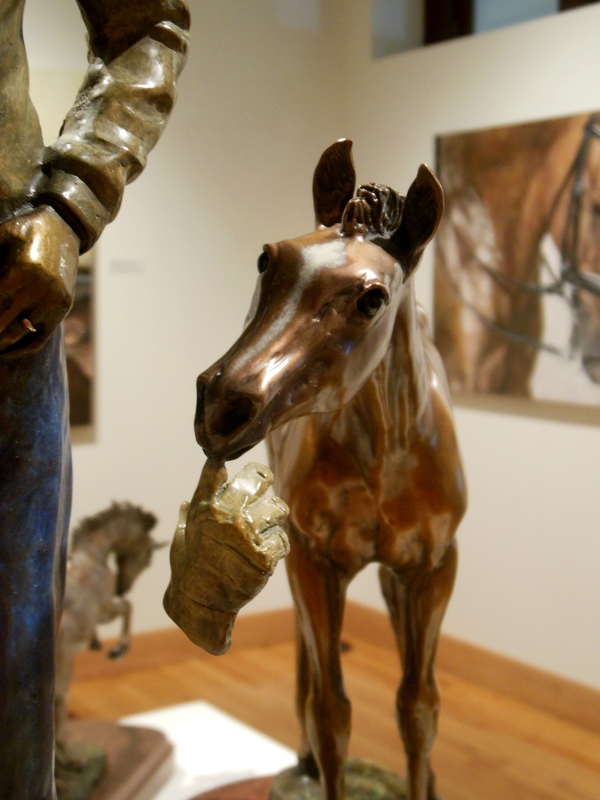 A Show of Horses, recently on display at Ohio Wesleyan University’s Richard M. Ross Museum, celebrated Delaware’s annual Little Brown Jug harness race with horse-related paintings by alumna Nancy Frank, bronze sculptures by Lynn Sappington and artifacts from the Harness Racing Museum and Hall of Fame in Goshen, New York. Harness racing became popular during the late 18th century. While aristocrats raced each other while riding galloping Thoroughbred horses, country folk started holding matches where the family horse would be harnessed to a wagon, pulling it as he trotted along the road, moving his right fore leg in unison with his left hind leg. Later, a special lightweight one-seated racing cart with bicycle-like wheels, known as a sulky, was developed. As the sport continued, horses were required to reach a certain time as they trotted the standard mile distance covered in the race. 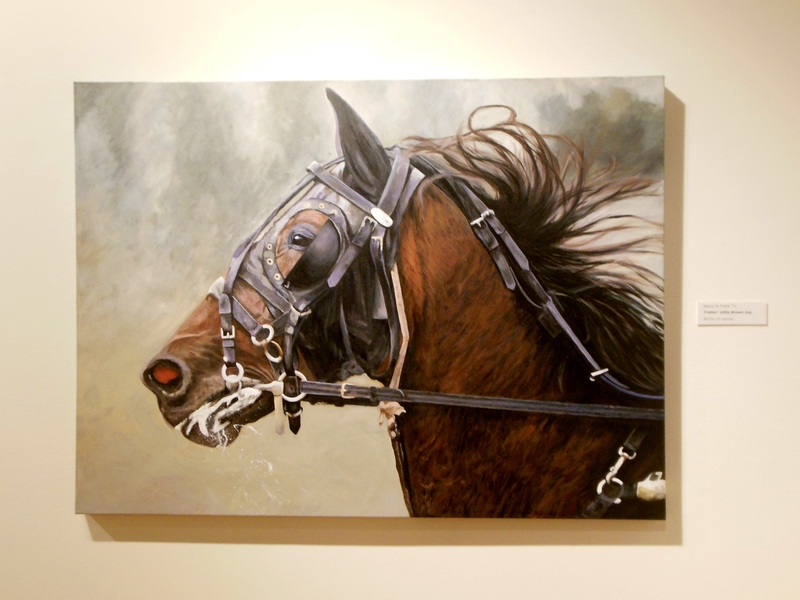 Horses who could pace or trot with an extended stride began to be called “Standardbred” horses. Trotting contests flourished, especially during county fairs. As their popularity spread, horses like Lucy the Pacing Queen, Sleepy Tom and Flying Jib became celebrities. 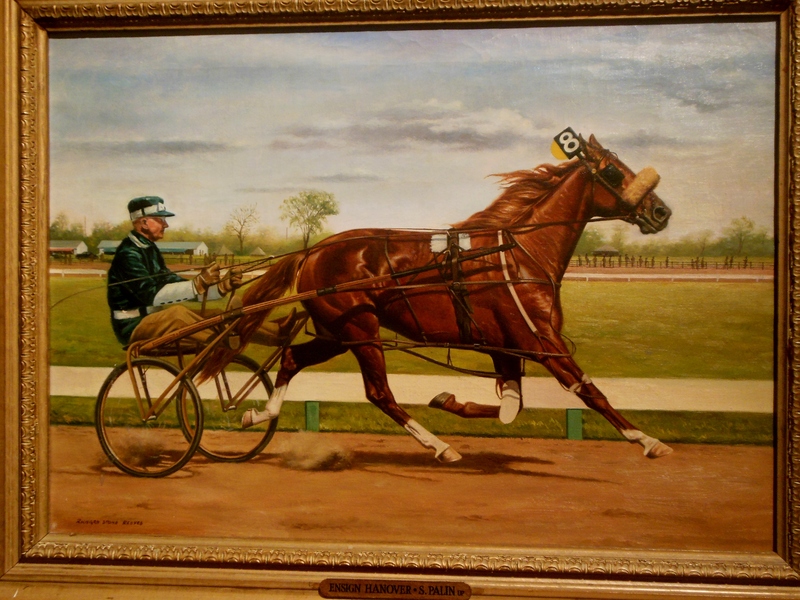 Americans wanted to have prints of their racing heroes to hang in their homes, and Currier & Ives – the famed lithographic printmaking firm that produced “The Best, the Cheapest and the Most Popular Pictures in the World” – delivered, offering almost 700 trotting prints for sale. 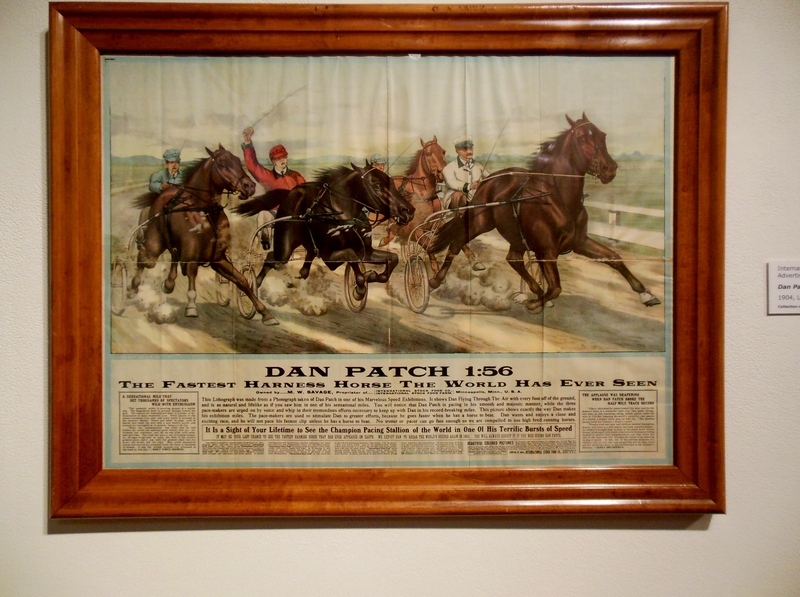 Dan Patch was one of the fastest and most popular Standardbred pacers to be immortalized in other souvenir lithographs. Newspapers reported that men yelled themselves hoarse and tears of joy streamed down women’s faces over the idol of the American turf’s record-breaking performances. People even paid $5 for a hair from his tail. 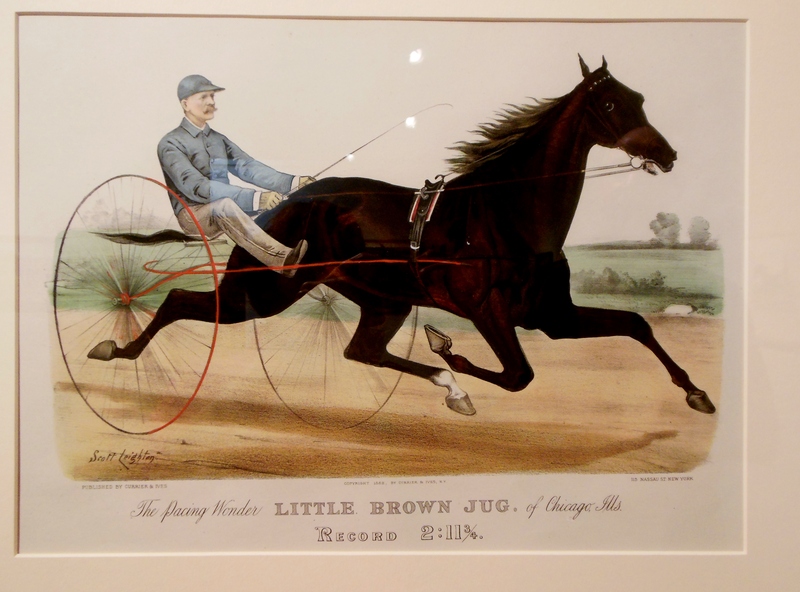 Held during the Delaware County Fair since 1946, the Little Brown Jug – whose name was the result of a newspaper contest – has grown to become the premier harness racing event for three-year-old pacers, or horses whose left fore leg and left hind leg move in unison as they race. The horses enjoy the fast half-mile oval racing track, while observers like being able to sidle up to the sport’s leading trainers, drivers and owners in the county fair atmosphere where the sport began. 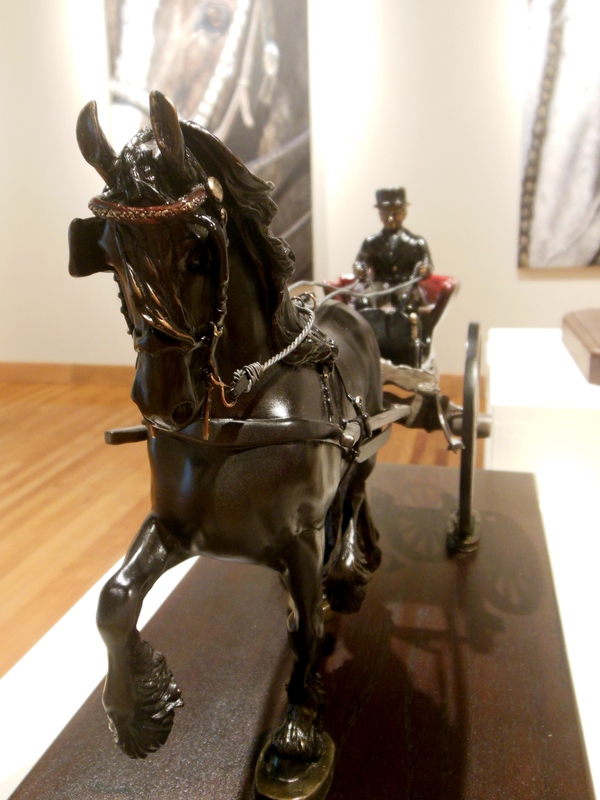 The exhibition featured driving jackets, trophies, and paintings of more recent Little Brown Jug participants, such as Ensign Hanover, driven by by Sep Palin. To read more about harness racing, check out 100 Years in Harness: A Pictorial Journey Through Harness Racing in the 20th Century, with photographs from the United States Trotting Association Archives, written and edited by Nicole Krafft; and “The Great Dan Patch,” a 1949 movie about the legendary trotting horse. Stable Girl: Working for the Family, by Patricia Harrison Easton; The Black Stallion’s Sulky Colt, by Walter Farley; and Born To Trot, by Marguerite Henry, are good picks for young readers. Hoof Beats magazine is a publication of the United States Trotting Association. For more on Currier & Ives, see Currier & Ives’ America: From a Young Nation to a Great Power, by Walton Rawls, and Currier & Ives: Portraits of a Nation, by Alexandra Bonfante-Warren. This entry was posted in Animals, Art, History, Museums, Sports. Bookmark the permalink.